The architect William Henry Playfair was born in Russell Square, London, July 1789. On the death of his father, Playfair was sent to reside with his uncle in Edinburgh. Professor John Playfair, mathematician and geologist and a leading figure in the Edinburgh Enlightenment, took control of his nephew’s education. Following his father’s profession, the young Playfair studied under William Starke of Glasgow. His first public appointment was the laying out of part of the New Town in Edinburgh in 1815. Then, after a visit to France in 1816, he established himself professionally by winning the commission in 1817 to complete the unfinished University buildings (leaving the front as designed by Robert and James Adam). He also designed the city’s Royal Terrace and Regent Terrace on the Calton Hill estate; the unfinished National Monument on Calton Hill; and, the Royal Scottish Academy and the National Gallery on the Mound. While Playfair’s most important works in Edinburgh have been executed in the Greek revivalist or classical style – earning for Edinburgh the title of ‘Athens of the North’ – he was competent in other styles too. He designed New College for the ten newly established Free Church of Scotland, a jagged-lined rendering of the Gothic style. He also built country houses and mansions in the Italianate and Tudor styles. Playfair died in Edinburgh after a long illness on 27 May 1857. His Trustees donated his drawings to the University the following year. Containing over 5,000 drawings, and with largely only a typescript catalogue of the briefest of descriptions, the collection presents many challenges. Despite these it is one of our most frequently consulted collections. 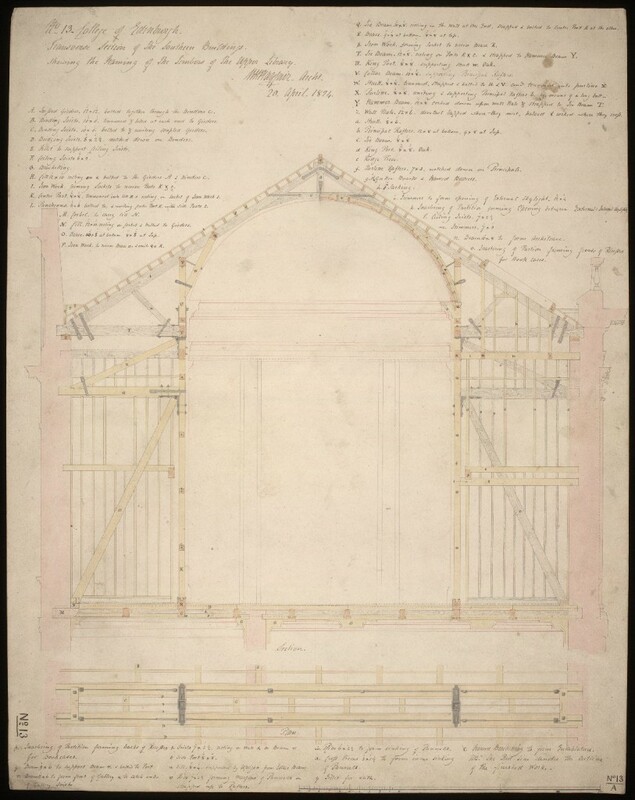 As part of our move to ArchivesSpace, we managed to get a the overarching structure of the catalogue keyed and online. Late last year we hosted a very productive seminar on Playfair, where academics, curators and others discussed Playfair, the collection and issues around both. This month sees the start of a project where we have two architecture students on placement who are going to make a detailed study of a subset of the drawings, identifying key information within them. This will be both general information (e.g. date, scale, type of drawing etc.) and also detail more specific to Playfair and the buildings. This will allow us to both improve the existing catalogue almost immediately and also draft an overarching schema for cataloguing the collection as a whole. This will then allow us to more accurately estimate the resource that would be required. Due to both the arrangement of the collection and familiarity (at least to some degree) with the building in question, the project will focus on drawings of Old College. We began with drawings covering the west range and south-west corner. 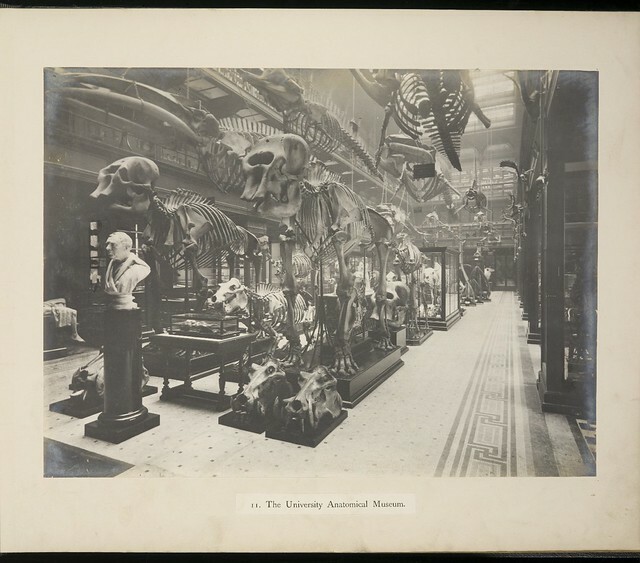 These originally housed Chemistry, Practice of Physic and the Natural History Museum and, even at first glance, the drawings are yielding all sorts of information, such as Playfair’s work pattern – he was generally producing one drawing per day. He also produced a number of detailed drawings at 1:1 scale. There is also much evidence of his innovative use of structural iron work. This project is a collaboration with Dr Richard Anderson (School of Architecture and Landscape Architecture), whose students, Federica and Xue, are contributing their expertise to a fascinating exploration of one of our most treasured collections. This entry was posted in Collections on 28/01/2016 by Grant Buttars.